This is the kind of day that we love, discovering a completely unexpected way to play and learn at the same time. I was loading up the dishwasher this morning, and as he often does, Ethan was trying to climb in and "help" by grabbing at the dishes. Just then he took a spoon out of the cutlery tray, and put it back in the tiny hole perfectly! So we took the cutlery tray out, got a few more spoons, and voila! The perfect toy! 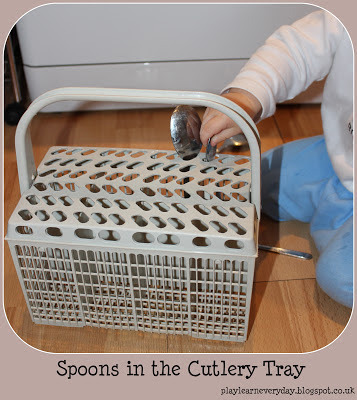 Ethan played with it for ages, taking spoons out and putting them back in. It was such a fantastic activity for his Physical Development as it really worked his fine motor control. We also made it a Problem Solving, Reasoning and Numeracy activity as I showed him that the spoons couldn't go in the other way (because of the shape) and I counted out the spoons as he put them in. For more fun ideas for babies, toddlers and young children come follow us on Pinterest and like us on Facebook.